1 Like all machines, a bicycle makes work easier. With a bicycle, it takes much less effort to get to where we are going than it would if we were walking. We can get many times farther on a bike even though we burn the same amount of energy. 2 Bicycles make this possible by using a combination of simple machines and the laws of physics. Bicycles have a number of simple machines included in their wheels, pedals, gears, and brakes that help the bike to move. When the rider balances on a bike, he does so according to the laws of physics. Even simpler parts like the frame of a bike take science into account. 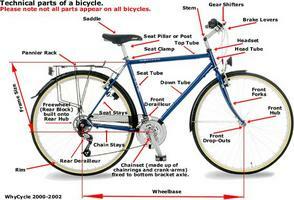 3 Two of the most important parts of any bicycle are the wheels and the gears. On flat ground, gears attached to the wheels increase the distance a rider gets from one turn of the pedals, allowing him to cover a lot of ground quickly. On hilly terrain, gears give the rider more power when it is needed by lessening the distance the bike travels.